LSA was initially called upon to provide a quality assurance and quality control process for the Foothill South Project for the Transportation Corridor Agencies (TCA). 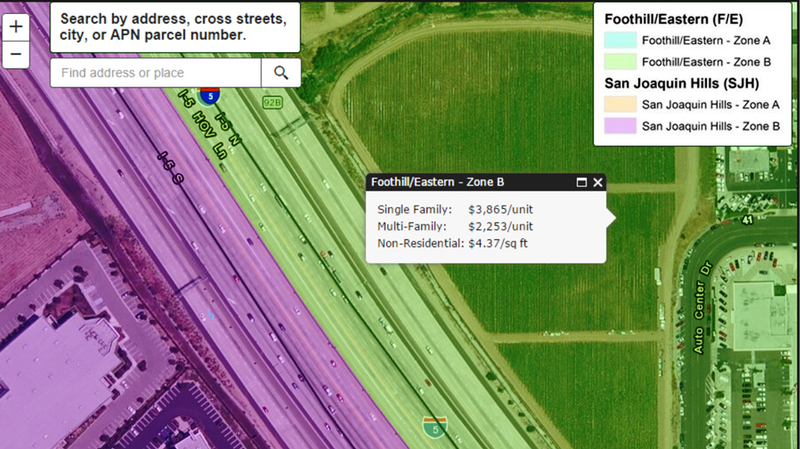 This work eventually grew into supporting the TCA’s GIS efforts for the entire Foothill South Project. LSA has provided GIS training and consulting for the TCA on all aspects of ArcGIS. LSA helped establish a small GIS network to further integrate existing and extensive CAD information (i.e., Microstation and AutoCAD) into ArcMap so that it could be mapped, analyzed, and reported on. Tasks ranged from on-site training and support, advising on the best method of analysis and best practices for mapping and plotting, data integration, and general support and maintenance of ArcGIS. The web map is pulling information from ArcGIS Online so that the base datasets can be changed by TCA staff directly. This allows for the flexibility of keeping the information current and avoiding the costs associated with maintaining ArcGIS Server on site. Most of LSA’s consulting work was completed using a remote desktop sharing program, which allowed for quick and easy access to both LSA and TCA computers. This greatly reduced the need for face-to-face meetings and thereby reduced the cost to the client. Increasing the convenience and reducing travel time allowed LSA greater input on work products that are indirectly related to GIS tasks, such as setting parameters for topographic surveying work and aerial photography. In between tasks, LSA acts as a support center for TCA’s project engineer (who learned GIS through LSA’s training efforts).